Sometimes you find yourself with a lot of fresh strawberries on hand, but it’s too hot to turn on the oven, you don’t have time to make something elaborate, and besides, you’d rather not ruin their farm fresh flavor by baking them anyway. Or not. Maybe that only happens to me? But don’t worry, if it happens to you I’ve got you covered. Just make this Grand Marnier Sabayon. Wait! Don’t let the term “sabayon” scare you. Sabayon (also spelled zabaglione) is just a fancy Italian (zabaglione) or French (sabayon) way of saying “light custard”. This recipe makes a silky smooth, luscious orange custard that somehow both complements and enhances the flavor of fresh strawberries. It literally takes just a few minutes to whip up, and it sounds and tastes fancy with very minimal effort. Also, I couldn’t stop eating it. The original recipe claims to serve 2, but we got more like 4 servings out of it. You could easily use fewer (or more) strawberries to accommodate whatever you’ve got on hand. Double the custard ingredients for each additional quart of strawberries. Make an ice water bath with a large bowl filled about halfway with ice and cold water. Set aside. Ine a large saucepan, bring about an inch of water to a simmer (don’t boil). In a metal bowl, whisk together egg yolks, Gran Marnier, water, and sugar. Set bowl over simmering water (don’t allow the bottom to touch water) and whisk constantly until mixture thickens to a loose pudding-like consistency – 3 to 4 minutes. Remove from heat. Whisk in yogurt. Place bowl in ice water bath and whisk for 1 minute to chill slightly. Divide strawberries among serving bowls. 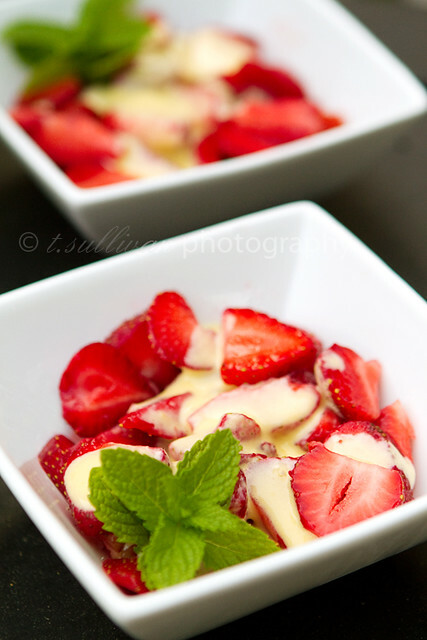 Spoon custard over berries, garnish with fresh mint and serve. Sabayon can be stored in an airtight container in the fridge for up to 2 days. Brilliant way to serve strawberries! I never thought of this. I love zabaglione and Grand Marnier. I’m definitely going to try making this. Fabulous! I’m always looking for ways to use strawberries without hiding them too. I will definitely try this! I made zabaglione for the first time a few months ago. I fell in love, to put it mildly! I must, MUST make with with Grand Marnier!!! !